The group was officially established on Aug. 16. WARSAW — The newly-formed Warsaw Evening Optimist Club is a volunteer club created by women, friendly and welcoming to all, and formed to benefit the children of our communities as we encourage, enrich and empower women to succeed in a diverse world. “As a long-time Optimist member, I saw a need in the community which was not being met. With lots of help from Northern Indiana District Governor, Sandy Doyle, and chartered by the Warsaw NOON Optimist Club, the Evening Club started out small with only a handful of core people that were invited,“ says Trina Hoy. “Over my years of Optimist service, and through observing my community, I met many people, mostly women, who wanted to be involved in community service but were looking for a different atmosphere or more demographic diversity then is currently available,” stated Hoy. 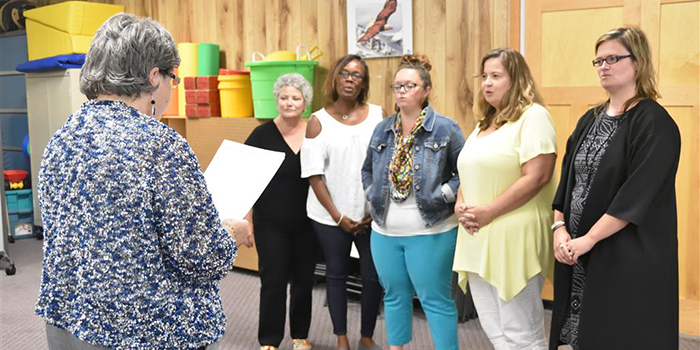 The group was officially established on Aug. 16, with the help of Optimist International liaison, Gary Addison; upcoming Lieutenant Governor for District Zone 3, Becky Mahoney; and current Northern Indiana District Governor, Sandy Doyle. Eleven of the Club’s 17 charter members were present along with some guests. Two members of the Warsaw Breakfast Optimist Club and three members of the Warsaw NOON Optimist Club who were present for support. This core group of women is on fire to share their time and talent to benefit the community. Some initial ideas are to focus on building self-esteem, confidence and leadership opportunities for girls of all ages. The core group continues to grow as they invite their friends and spread the word throughout the community about this new Optimist Club. The Warsaw Evening Optimist Club currently meets twice a month on the first and third Thursday of each month at Community Grace Brethren Church, 909 S. Buffalo St. from 6 to 7 p.m.
To find out more about the Club, contact Trina Hoy at (574) 551-6386 or email her at [email protected] You can also find the Warsaw Evening Optimist Club on Facebook.